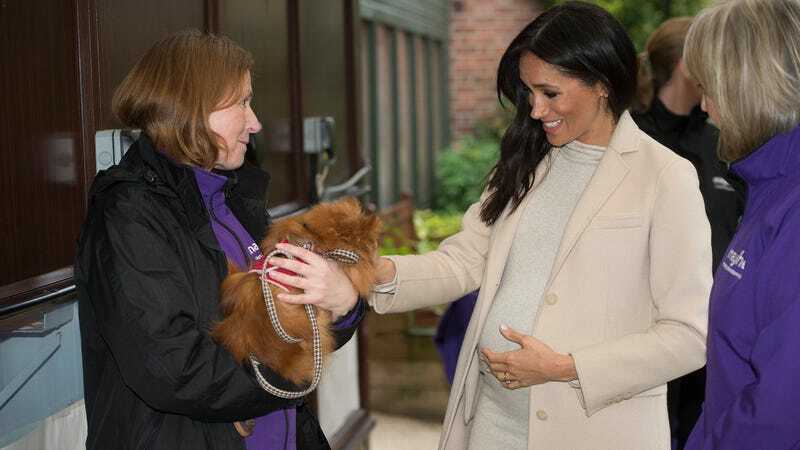 Meghan, the Duchess of Sussex meets ‘Foxy’ during her visit to the Mayhew, an animal welfare charity on January 16, 2019 in London, England. This will be Her Royal Highnesses first official visit to Mayhew in her new role as Patron. Now that Meghan Markle is nearing the third trimester of her pregnancy, she’s no doubt running into the issue most pregnant women do, million dollar clothing budgets notwithstanding: What to wear? Whether in acceptance of her (temporarily) changing body or in solidarity with the masses of non-royals she now comes in contact with in her role as Duchess of Sussex, Meghan has so far proved adept at high-low style, as proven by her Monday appearance in a $1,400 coat, which she paired with a less-than-$100 dress from Aritzia. On Wednesday, Meghan did one better, pairing a $34.99 beige H&M sweater dress with a similarly hued cashmere overcoat by Emporio Armani topcoat and beige suede slingbacks from Paul Andrew. In effect, the duchess gave us the epitome of tonal chic as she performed the duties of one of her new patronages. Of course, the fast-fashion dress has already flown off the shelves and is currently sold out at H&M, but because it’s H&M, don’t be surprised to see a restock or some variation on the dress in the near future (because that’s how mass production works). Transitioning to glamour for evening for the premiere of Cirque du Soleil’s “Totem,” the Duchess donned a $5,600 navy sequined Roland Mouret gown with elbow-length sleeves and a leg slit. She accessorized the look with a Givenchy satin clutch and strappy black sandals from Stuart Weitzman. Prince Harry, Duke of Sussex and Meghan, Duchess of Sussex attend the Cirque du Soleil Premiere Of ‘TOTEM’ at Royal Albert Hall on January 16, 2019 in London, England. Why do we care? Because aside from royal-watching being big fun (for some of us), pregnancy is notoriously a time when women feel challenged for fashionable options, because they are sadly still far and few between. But while most of us can’t afford custom Mouret or Emporio Armani, royal-worthy looks can be mimicked for far less. For instance: It may not be in beige, but as of press time, H&M still has a gray version of their MAMA fine knit dress available for $34.99. Paired with a gray topper from the Gap (now on sale for $44.99), non-royal expectant moms can still have their own monochromatic moment. And while you may not have a formal event to attend during pregnancy, this $56 navy jacquard dress from ASOS (which has an impressive maternity collection) is able to equally transition between the office, brunch or even a wedding, just by switching up the accessories. But should you need to go glam during your 40 weeks, an all-over sequin dress from Little Miss Maternity (also at ASOS, $135) will help you stay chic. And if full-length sparkle is what you need, Pink Blush offers a strapless sequined maternity gown in black and rose gold ($129), also available as a sleeveless option in three colors (also $129). OK, so it’s not Roland Mouret, but these options are far more versatile and practical than a $5,600 one-and-done dress. And since last time we checked, kids are expensive, so isn’t that really the chicest outlook of all? She Got That Glow: Is It Too Soon to Say Meghan Markle&apos;s Maternity Looks May Be Her Best Yet?